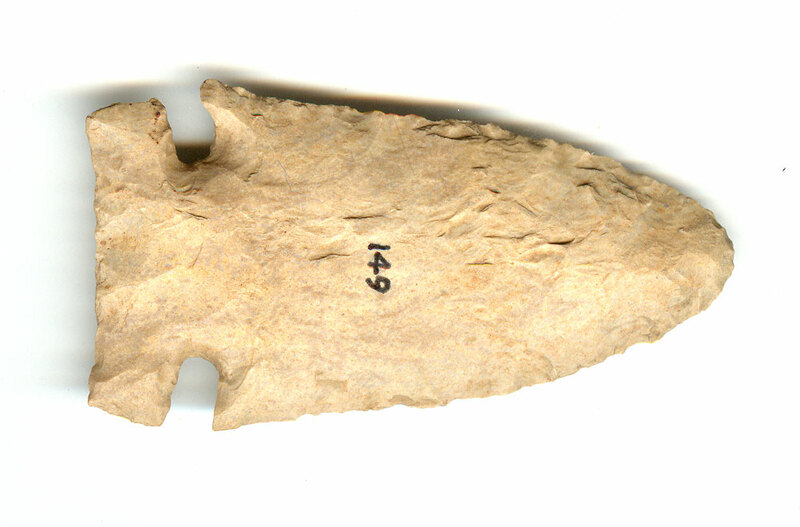 A Large, Visibly Aged And Anciently Use Sharpened, Sturdy And Well Made, Cache River Point That Exhibits Surface Oxidation Aging And Stone Coloration Patination, Aged Surface Mineral Deposits, Aging In The Side Notches, Correct Early Style Blade Flaking, Correct Basal Edge Hafting Dulling, Visible One Side Extended Ground Exposure, Correct Material And Manufacture For The Area Found. Found In The Vicinity Of The Olive Branch Site. Ex-Steve Dowell Collection. Illinois Side Notched Points Are Made Differently Than The Arkansas Types, Possibly Being Related To The Thebes Points! Includes A Ken Partain Certificate Of Authenticity.